A month or so ago I ate dinner with my parents and Mom had made mini-crescent rolls stuffed with cream cheese. I must have eaten 12 of them. Because it was just an addition to dinner, Mom kept them tame with just cream cheese. She usually adds other ingredients mixed into the cream cheese before she spreads it on the crescents. I was surprised at how the roll and the cream cheese together created such a nice flavor base. That's why I knew I couldn't go wrong if I added bacon and onion to my own version of crescents. I did test smoked ham and dill pickle, too, which was really good. But in the end I went with the bacon and onion crescent. What I like most about this column is its simplicity. Any cook can make this and it only takes half an hour. Anyone could load up a full tray of these in no time and be the hero of a potluck diner. I like the sequence in step two that shows the crescent being rolled in four photographic steps. In the future I'm going to explore this technique as a way of showing something being rolled like a burrito or cinnamon rolls ... Oh man, I'm feeling another column coming on! It doesn't take hours sweating over a hot stove to cook something absolutely delicious. 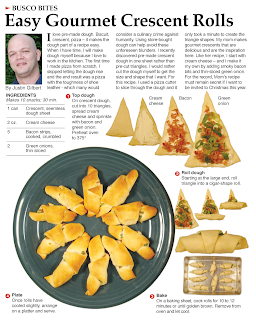 The gourmet crescents are a perfect example. 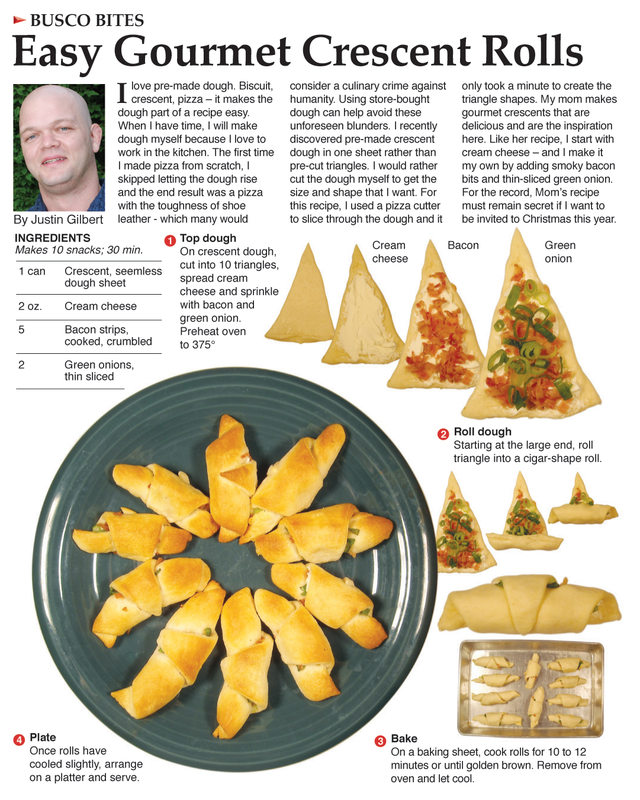 Store-bought dough, some creativity and a couple of tasty ingredients -- and in no time you have a star for the diner table. 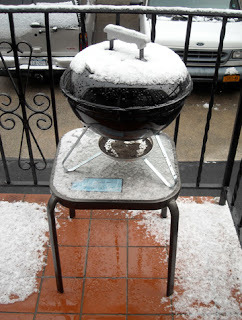 Snow covers the grill - again. The warm weather was upon us. I had grilled for the first time this spring. And then Mother Nature says "Not so fast giddy grill man!" Last night New York got enough snow to create a light-slushy layer on everything – including the grill I had bragged about using in this very blog a couple days ago!!! The weather yesterday was crazy! We had it all – rain, snow, hail and lightning! At one point my girlfriend was forced to sprint top speed to save herself from being pelted by a hail strom that blew in, which sounded as if the sky was dumping gravel on the city. It seems that every year we get a warm glimpse of summer – just before we get smacked by a blast of winter. I hope this is the last blast - It's time to get my grill on! Who Else is Ready For Grill Season? Bridge in New York City. I hope everyone took advantage of the hint of spring that was given to us last week for most of the Midwest and Northeast. I went crazy. Three meals in two days - all on charcoal! What makes this worth blogging about is that this particular grill and porch are in New York City, where I'm staying for a couple of weeks! A porch in New York is the equivalent to a lake in your backyard else where in America. 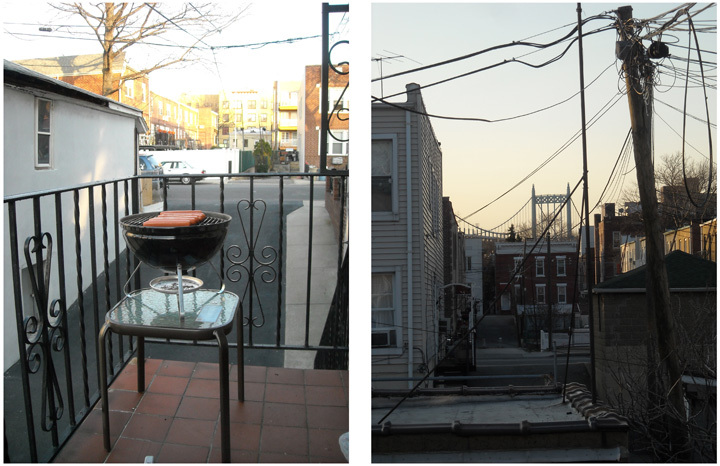 A charcoal grill on that porch – Well that's just Big Apple heaven! Got Onions? Make this Yummy Treat! I love to caramelize onions. Their flavor can't be beat and they can enhance just about any dish. That's why I love to make this soup. It is amazing how onions are transformed from their pungent raw form into a savory and sweet delight with just a little time over some heat. 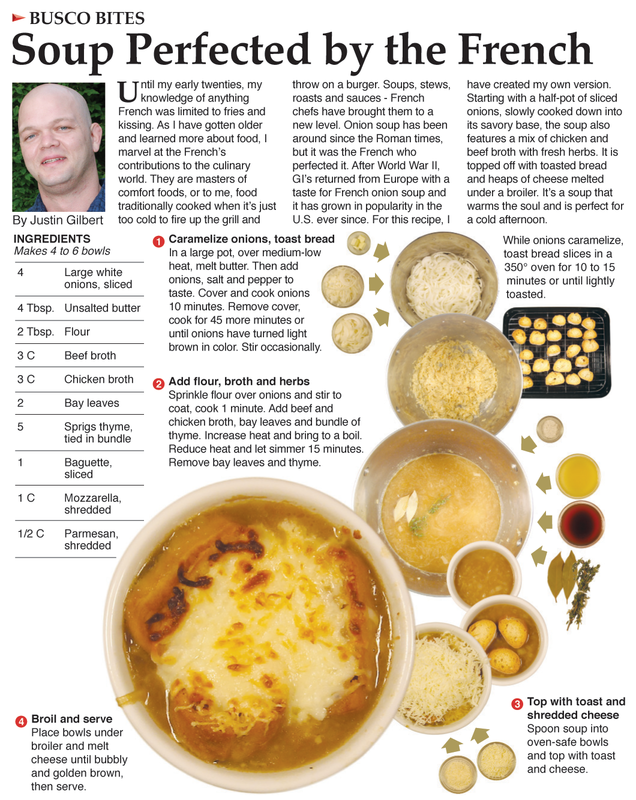 I read many French onion soup recipes before I created my own. They all had one thing in common - enough sliced onions to make a stadium full of people tear-up. Gruyere was the cheese most of these recipes called for to melt on top of the soup. But when I went to buy it, I didn't have the heart to spend $6.30 on a 4 ounces of it - especially when I had shredded mozzarella and fresh parmesan at home in the fridge. The mozzarella melted well and worked just fine as a gooey topping to the soup. The bread pictured in the recipe was over-toasted. I wrote the correct toasting time into the recipe, but I let mine go for more than 20 minutes, making it a little harder than I would've liked. Luckily I caught it before it actually burned. Because it wasn't central to the dish, and more of a topping, I still used it but the crust was a little tough. I had to let it soak in the soup for a while to bite through it. I was thrilled to sneak a reference to french kissing into the introduction. I giggle every time I read the first line. I guess I'm still a 12-year-old at heart. I am especially pleased with the layout and design this week. There is a lot going on - making the soup, toasting the bread and melting the cheese over the soup - plus all of the prepped ingredients. Eighteen photographs in all. That might be the most photos I've ever used to visualize a recipe. That surprised me because when I was shopping I thought to myself that the recipe was relatively simple. And it is if you're just looking at the list of ingredients. Making it however, requires some extra steps. I thought I was able to convey those steps well in a visual sense. I made a casserole recently and I seasoned it with a packet of French onion soup. It was flavorful and tasty AND it gave me indigestion! It seems easy for cooks to just grab pre-made packets to make a soup like this. But this soup is so much better and so much more healthy when you take the time to make it using fresh ingredients! Anyone who knows me well has had one of my gourmet pizzas -- they're a specialty of mine. I'm adding this pizza to my pizza-party menu from now on. As I mention in the introduction, the egg and cheese together give this pie a creamy-goodness unlike anything I have ever had on pizza. The breakfast flavors totally work on a slice also. This recipe is a gourmet pizza experience! 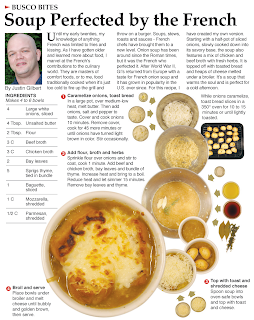 I stand by every recipe that is featured in my column. If something doesn't taste right I do it over again. They all have to meet a certain standard of excellence before I'll use it. But every once in a while, one of my recipes stands out above the rest. This weeks creation is one of those. 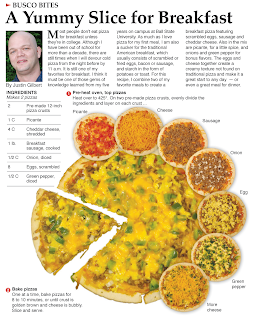 This is the second time I have featured a gourmet pizza in the column. I chose to use the same design concept as the first time. 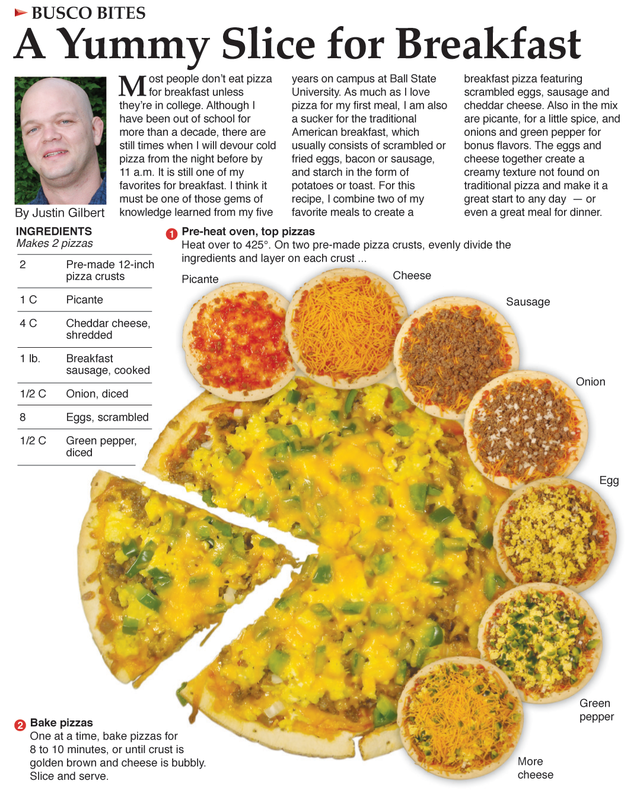 Each individual layer is shown as the pizza is built, and those layers float above the fully cooked pie. I plan on doing more pizzas in the future and I'm going to follow this format; I think it's attractive and works well. They look like they are in the same family design-wise, but each will be different because they are different recipes with different ingredients! You don't have to be in college to love leftover pizza for breakfast! College is when I discovered it - or at least really started to enjoy it. I highly recommend saving a slice or two for the morning the next time you have pizza for dinner.